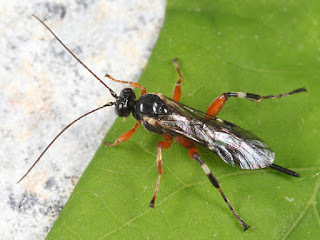 Pimpla sp. Photo from Bugguide......copyrighted to Tom Murray please don't sue. :P Link here for personal reference only. First off I want to say LONG TIME NO SEE!! I haven't been here in so long. Life's been crazy......but for the first time in a long long time I'm quite content atm sitting here blogging away about my lovelies listening to Lepidopteran Anthems (you know what I'm talking about ^^) and I haven't felt like this in quite a while so I'm happy. Was there for quite a while....went out came back and took this one (had gotten 2 vids, this was the better of the 2). So I wanted to see if I could ID it. These are very common here. I've seen these quite a bit along with Ophion spp. & something that looks like Torymus spp. on steroids, all almost on my terrace windows or in the lobby window.